Discussion in 'Reviews' started by WY_Not, Oct 22, 2018. Yes, yes, I know it isn't a BCUSA tarp (which I would still like to get one day) but it was what I could swing at the time. So, put away your torches and pitchforks. Bought it mainly for the relatively light weight and the tie outs (lots). The price didn't hurt and while the saying "you get what you pay for" usually applies to most camp gear, this thing punches well above its weight class. There are three tie outs with grommets along the ridgeline / center seam, a tie out at each corner, and three more tie outs on each side. All the tie outs are equally spaced and the two edge tie outs on the ridgeline also have grommets like the three ridgeline tie outs. It is 10 x10 ish (118" x 126"), comes with a stuff sack and some paracord. Don't remember seeing any of the plastic sliders that are shown in the picture. Not a big deal, I'd rather just use a taut line hitch. Used it the first time this weekend (trip report link) It rained pretty steady the first night and the second night was very windy. Stayed warm and dry both nights. They do a good job of waterproofing the tarp from the factory. Not a single leak all weekend despite my pack getting shoved against the tarp at some point during the night. Was very pleasantly surprised that no rain bled through at the point of contact. The numerous tie outs make the tarp very versitile for use in a number of different configurations. I used a modified A-frame configuration, using a couple of carabiners to close off the ends a bit to provide additional protection from wind and rain. I used the 2-strand twist ridgeline from Bushclass as the ridgeline. One end tied off to a tree and the other end held up by a pole made from a small sapling and secured with a tent stake I made. Two additional guylines off to the sides provided stability to the tent pole. Perhaps the one thing I would change about this tarp is to add a tie out or two inside on the center seam. To be able to hang a bug net inside during the summer months would take this already great tarp to the next level. I will definitely be using this tarp again, have another outing scheduled for next weekend in fact. 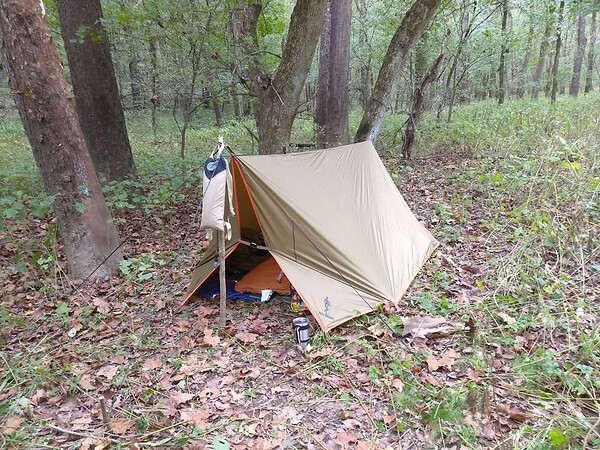 I would definitely recommend it to anyone looking for a low cost, versitile tarp. Sabb0007, Rockgod1619, LostViking and 16 others like this. Nice review. It looks really good. Run a length of paracord inside the ridge, with a couple or 3 loops tied in it for hanging stuff. Vilke, JeffG, Bobsdock and 5 others like this. What is the weight of the tarp? At their site it is said to be "ultralight"? Bobsdock and WY_Not like this. Amazon says the product weight is 1.6lb. Couple of reviews that mentioned weight called it at 2lb 3oz. It didn't seem that heavy to me. I'll break out the scale tonight. Bobsdock, Tor Helge and PAcanis like this. Sometimes Amazon lists shipping size or weight. I'd be interested in real world weight, too. WY_Not and Bobsdock like this. Can't find the scale. Will post a weight when I get a hold of a scale. I saw @WY_Not ’s set up. The tarp looked top notch. I have a BCUSA tarp, and based on initial impressions, I’d choose the Free Soldier. I believe the FS seams are sealed and the BCUSA seams are not. FS is 2/3 the price. Odinborn and WY_Not like this. Been raining all weekend. Dry as can be. No leaks. JasonJ, Rockgod1619 and PAcanis like this. Great review! Looks like a good tarp for the money. Thanks for the write up. If I was in the market, I would definitely would consider it. My BCUSA tarp is still going strong right now but this looks to be a value. I was looking for a high-quality, low-cost option for hammock camping once I decided I couldn't sleep on the ground anymore. I picked one of these up based on a short user review here and haven't looked back! Very excellent piece of kit, for sure! WY_Not and PAcanis like this. I use their version 1. Works like a boss!